Synopsis: South Central, Los Angeles. Cleared of homicide charges after a shootout, LAPD Officers Taylor and Zavala return to duty, with Taylor recording both their professional and personal lives on digicam. In a dispute between African-American gangbanger Tre and his mailman, Zavala earns Tre’s respect by keeping a scuffle off the charge sheet. Later the partners find the burnt-out remains of a car used by the Mexican ‘Curbside’ gang in a drive-by against Tre’s crew. Taylor finds a crack-addicted mother’s children bound and gagged in her closet. Answering complaints about noise levels at a party, Taylor, Zavala and their fellow officers Orozco and Davis square up to Curbside leaders Big Evil and LaLa. Later Taylor and Zavala arrest a Curbsider in possession of guns and money – and are then awarded for rescuing three children from a fire. Returning to the Curbside house, the two uncover a people-trafficking operation, and are warned by a Federal Officer not to mess with the Mexican cartels. Meanwhile Zavala’s wife Gabby has their first baby, while Taylor’s relationship with girlfriend Janet leads to engagement, marriage and pregnancy. They arrest a man who has injured two other police officers. Checking in on a missing old lady, Taylor and Zavala discover a large drug haul and many mutilated bodies. Tre warns the pair that there is a hit out on them (from a Mexican cartel). The officers pursue a car into a Curbside ambush. After Taylor is severely injured, Zavala is killed protecting him. Review: David Ayer specialises in Angelenos who straddle the line between law and criminality. Training Day (2001), which Ayer wrote, and Street Kings (2008), which he directed, as well as many of the films that he has co-written – The Fast and the Furious (2001), Dark Blue (2002), SWAT (2003) – each feature at least one LA policeman who is either deeply corrupt or flirting with the other side; while the unstable protagonist of Ayer’s directorial debut Harsh Times (2005) cannot decide between joining the LAPD, working for Homeland Security, or peddling guns and drugs himself. So when, at the beginning of Ayer’s latest feature End of Watch, Officer Brian Taylor (Jake Gyllenhaal) is heard in voice-over declaring, “We stand together, a thin blue line, protecting the prey from the predators, the good from the bad,”, viewers may be forgiven for expecting these words to foreshadow a rather greyer moral line – and when Taylor describes the police locker room as “the place where the forces of good prepare to fight the forces of evil”, many will no doubt assume that his sentiment will be heavily ironised by whatever follows. But no. As Taylor and his partner Mike Zavala (Michael Peña) patrol the streets of South Central, they adhere to a strict routine of good cop/good cop, rescuing children, fighting crime, and – eventually – bleeding for their cause. Meanwhile, as though to underline the film’s ethical certitudes, a Mexican street gang is led by a man known only as Big Evil (Maurice Compte), and peopled by a rogues’ gallery of badass caricatures. The film’s racial politics are a little less black-and-white than its morality. Much of the bromantic banter between WASPish Taylor and Hispanic Zavala is dedicated to gently mocking their ethnic and cultural differences, while the crimes that they investigate trace a demographic shift from African-American to Mexican dominance. None of this is drawn subtly – black gangbanger Tre (Cle Sloan) is in the middle of complaining that the street’s chicken shops have been overtaken by taco stands and that “it’s going to be extinct niggers pretty soon” when an expressly territorial drive-by shooting interrupts him, conducted by Big Evil’s gang as though in direct response to Tre’s pronouncements. Still, Ayer does maintain a certain balance: if the deleterious impact of Hispanic gangs and the Mexican drug cartels is highlighted, a more salutary picture is suggested by scenes that involve Zavala’s extended family celebrating birthdays and weddings; and if Big Evil’s gang includes a no-nonsense lesbian Latina (Yahira Garcia), then Taylor’s unit has one of those too (played by America Ferrera). Accordingly, the film presents a dialectic between exclusion and integration, order and underworld, which at least strives to be even-handed, although the results are often also absurdly broad in their delineation. 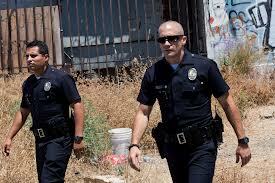 Ayer’s decision to incorporate ‘first-person’ camerawork, compiling what we see from a (fictive) selection of digicam footage shot by Taylor, Zavala and the crews of Tre and Big Evil, was no doubt intended to infuse End of Watch with a gritty, ground-level realism – but such verisimilitude is undermined by Ayer’s bizarre decision to interweave this ‘found footage’ with other, entirely non-diegetic shots (often filmed, confusingly, in the same visceral handheld style). Viewers who attempt – as the film’s focus on POV demands – to determine who is filming what at any given moment will quickly discover that the authenticity normally associated with this cinematographic method yields to a messier kind of postmodern decentring which in no way serves – let alone protects – an otherwise oversimple story of good and evil. Glad you highlighted the film’s pretty blatant racial politics, which, mystifyingly, so many reviewers missed. Painting Mexican as boogeymen instead of blacks, or, as that Tre character might say, the “changing of the guard.” Also agree re the cackhanded combination of ‘first-person’ shooting and non-diegetic camerawork – it was an illogical mess, undermining itself.